The food in South Africa is fresh and superb. The best fillet, rump and sirloin steaks are on almost all menus and you don’t need to stop at beef. You are likely to find the opportunity to try ostrich steak, springbok steak and there are restaurants that specialise in game. Seafood forms a significant part of menus at restaurants on the coast. It could not be fresher and at some you can literally watch the catch being brought in straight from the sea. There are bright orange lobsters, succulent prawns, oysters, calamari and mussels as well as white fish such as kingclip which is similar except meatier to Atlantic cod, sole which does not have any resemblance to its European counterpart, but very nice all the same. Enjoy the best seafood without breaking the bank. South Africa has assimilated foreign dishes as its own in much the same way that the Brits have. Greek salads abound, calamari, pizza, curry, cheesecake, chocolate mousse are all fairly common. For us Brits some of the items can be a little strange, such as monkey gland sauce which sounds revolting but is actually a barbecue flavoured sauce eaten with steaks. South African traditional dishes that you are likely to stumble across include lightly spiced Bobotie which is a minced beef dish with a spicy yellow coloured sauce and for dessert Malva pudding is a light sponge pudding or cake. Otherwise, the dishes on the menu have a strong similarity to food back home except better and fresher. 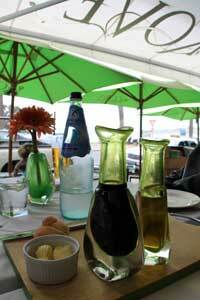 Service is generally excellent in South African restaurants. Inevitably, the more popular a location with tourists, the higher the prices.